After the hectic and enjoyable morning at Seaford, I nipped over to Brighton Marina yesterday evening in the hope of bass that might fancy something from my bucket of treats, namely the heads and guts from the morning’s catch – yummo. I arrived on the east arm at about 7.15 and walked out to the 40’s where I would meet up with Danny, Mike and Ant, who had got down there earlier. I was looking forward to seeing what festering crap Danny had brought with him this time for bait! as I got to the mark, our heroic trio were already hard at work with their – what seemed like – fifty rods between them. I was surprised (and disappointed) when I heard that they had fresh bait. My spirits were lifted later on in the night though when Danny cracked open a hermit crab and I heard that shout of “It’s minging”. Ah, normality resumed! After the usual abusive pleasantries, I set up for the night – one rod with feathers for some fresh mackerel (by now my bucket of heads was smelling pretty awful and had liquefied), one scratcher with a size 4, two hook flapper, baited with lugworm and the bass rod using a long link running ledger, long trace and single 6/0. 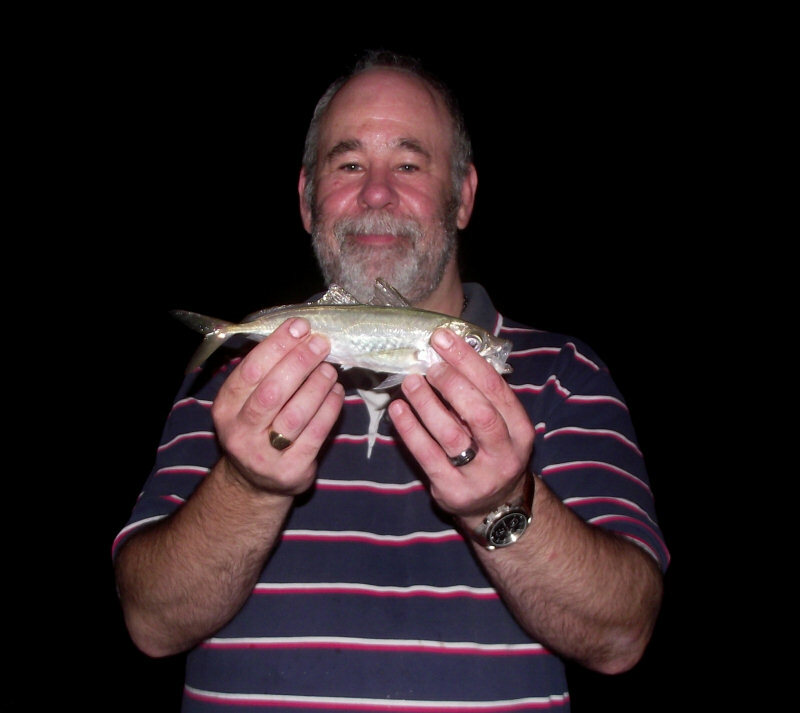 First chuck with the feathers brought in a joey mackerel, so it was quick change and off came the single 5/0 on the bass rod and swapped with a sliding live bait rig; within seconds, the joey was back out. once the livey was expired, I started using mackerel head ‘n’ guts and fillet from fresh the mackerel I was catching on the feathers – I managed half a dozen before calling a halt. Despite my best efforts, the bass rig was ignored all night. The scratching rod? Well, to cut things short, that stayed untouched all night! The only other thing to come aboard for me, was a lone scad (pictured), otherwise known as horse mackerel on feathers – not a very inspiring fish but at least it’s another one ticked off the species list. As for the three musketeers, I think they had a mix of mackerel, small ray, small smooth hound, pout before finally bottling it and escaping by about 1am. I, of course, stayed the duration but even my normal optimism was well and truly dashed by about 3am, so decided on getting off home. Not had a lot of luck at the marina this year really – but to be fair, I haven’t fished it nearly as much as I have in previous years, so maybe I should put a few more hours in and pay it more attention.